After more than two decades of hard work, the LPC heard testimony on Tuesday for a much-anticipated Morningside Heights Historic District. Representatives from Jerrold Nadler’s, and Daniel O’Donnell’s offices spoke in favor of designation, as did Basha Gerhards on behalf of Manhattan Borough President Gale Brewer. Several neighbors, volunteers, and historians spoke out, as did Professor Andrew S. Dolkart, who spent seven years working on his book Morningside Heights: A History of its Architecture & Development. The hearing was covered by CURBED, DNA Info and PATCH. Find LW! Testimony below, and stay tunefd for a final decision by the LPC expected in January 2017! The Certificate of Appropriateness Committee wishes to comment on the proposal to designate a Morningside Heights Historic District. This would be an approximately 115-building district that reflects the residential development of Morningside Heights, primarily comprising residential buildings, with some institutional buildings, largely constructed between the 1890’s and 1920’s. LANDMARK WEST! is elated to support our neighbors to the north in this essential Historic District proposed for the UPPER Upper West Side, aka Vandwater’s Heights, aka Cathedral Heights, aka Morningside Heights—by any name, it’s a vibrant, distinctive and significant historic neighborhood that should be protected without delay. In tumultuous times, it is reassuring to know that there will be some stability and coherence in the future. 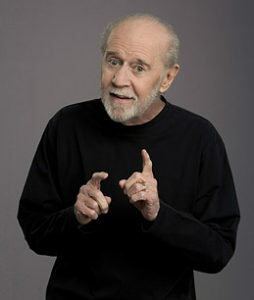 The late, great comedian George Carlin grew up in Morningside Heights (yet another reason to designate it!). His missives and one-liners resonate with this preservation advocate. While this family forum won’t let us share all of his thoughts, one can look to his infinite wisdom for guidance. For example, I think the duty of the comedian is to find out where the line is drawn and cross it deliberately. Sage words for sure. The proposed southern boundary of the Morningside Heights Historic District shares a southern tangent edge with the recently designated Riverside Drive-West End Avenue Historic District Extension II. Crossing this former boundary connects Riverside Drive from 108th Street now through 119th Street. This new line will add protections for buildings by Gaetan Ajello, Simon Schwartz and Arthur Gross as well as Benjamin and Benjamin, in our district alone. It also protects a healthy swath of buildings recognized as “the city’s largest ensemble of institutional complexes as well as an extensive concentration of early-twentieth-century middle-class apartment buildings”. Another nugget of wisdom, No one knows what’s next, but everyone does it. May we suggest a Morningside Heights Historic District extension two blocks further north to include George Carlin Way, and his childhood home on 121st Street? Another example, Property is theft. Nobody “owns” anything. When you die, it all stays here. Such is the hope, at least. A preservationist in spirit, Carlin clearly saw that there was something greater than himself and his time here. Just as a Historic District represents the endurance and sanctity of the collective. Something we’re the caretakers of and pass on to future generations. And in closing, remember, The future will soon be a thing of the past. LANDMARK WEST! supports this long-anticipated designation and thanks the LPC for your attention to this special asset. Dolkart, Andrew S. Morningside Heights: A History of Its Architecture & Development. Columbia University Press: New York. 1998. P. ix.